RAZER new innovation called RAZER TURRET. 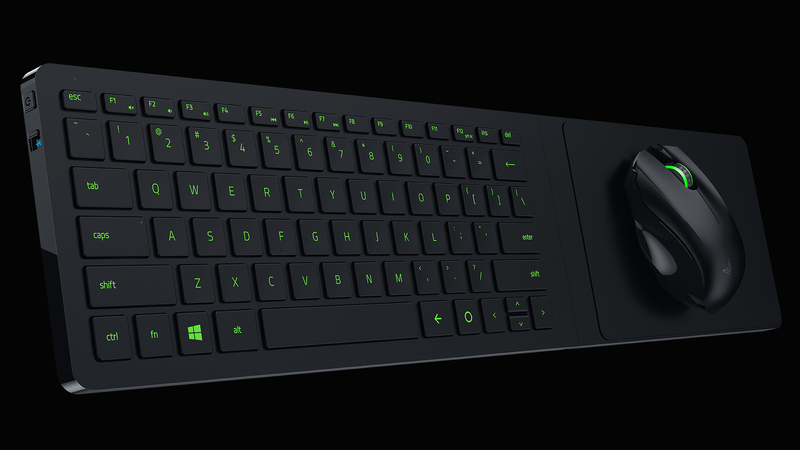 The Razer Turret lapboard is a combination of a keyboard, a mouse, and a mousing surface that is designed to be used on the couch in front of your TV. It connects wirelessly to nearby devices such as Razer’s Android gaming console, and promises extensive battery life. The lapboard is rated to last for four months on a charge, the mouse can do 40 hours before needing to be plugged in again. The Turret name stems from the storage method for this peripheral — that, interestingly, sits in the gaming controllers section of Razer’s website rather than being part of its new keyboards portfolio — which sees the lapboard folding up and standing erect not unlike a weaponized turret. The Razer Turret bridges the gap between your PC and your couch nicely. It’s just a keyboard and a mouse — peripherals that are not a big deal, but there’s a lot of thoughtfulness in the design that kicks it up into the realm of must haves for a very certain kind of person: the couch gamer. The whole setup runs over 2.4GHz wireless or Bluetooth, so it is not difficult to configure, and there are no garish LEDs to tweak with downloadable software. The Razer Turret is pleasantly simple. Razer includes a sleek-looking dock setup to keep the mouse and keyboard out of the way when it is not in use. Another benefit: the dock charges the peripherals too! The idea of making the mouse and keyboard couch-friendly is not new, but there aren’t many solutions that don’t clutter up your living room with loose elements or look excessively dorky. Razer’s solution isn’t cheap, but its ability to keep things clean could be priceless.